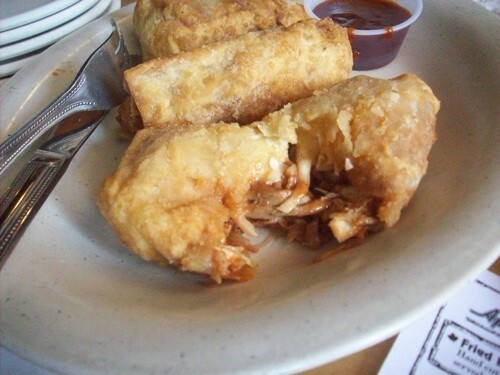 We started our lunch today at Kooky Canuck with the BBQ Egg Rolls, basically pulled pork and slaw deep-fried. BTW, Kooky Canuck is celebrating Canada Day on Friday, July 1st with a poutine-eating contest. For those who have a tough time deciding between tempura and sushi: the veggie tempura roll (at right) from Kamida, the small sushi bar at the Holiday Inn downtown. Co-worker Chris is just done with an extreme makeover of his kitchen. And with that upheaval comes a letting go of various items — a microwave, the odd bar tool and containers, wonderful clay bowls, and a selection of enticing retro wares, from a fabulous wood-grain dish stand to more than one selections of very sweet cup and saucer sets. I've managed to restrain myself so far from taking anything home, as I'm trying to de-clutter myself. But those cup and saucers? No way, no how. I'm fundamentally against them. In this week's cover story, the staff ponders what they'd do on their last day in Memphis. A few of us touch on what we would eat. John Branston would make stops at the Rendezvous and the Little Tea Shop. Chris Davis would eat his way up and down Summer Avenue. 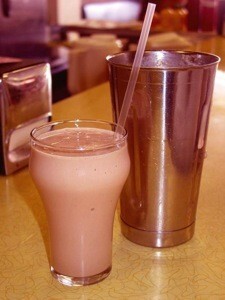 And I would finally have a Wiles-Smith milkshake. So, what would be your last meals in Memphis? Presented without comment ... somebody left a fruit cake and romance novels up for the taking in the company breakroom. Last week, we went to Acre for lunch. I'm not sure the restaurant could be any prettier. The decor, the gardens, the lighting ... everything was just-so. Of course, this scrupulous attention to detail extends to the food. The Pink Palace issued a press release yesterday titled "What, no restaurant?" The release, which lists the museum's attributes and stats, is a call for potential vendors. John Branston lists 50 small ideas for a better Memphis over at his City Beat blog. A handful of those ideas are food-related. Among them ... boiled peanuts. Yuck. I cannot stand boiled peanuts. Branston says I'm not redneck enough to appreciate them, but I am plenty redneck. I popped by Big Ono Bake Shop yesterday morning for a butter roll (88 cents). It's sweet but not to the point of being a pastry. It's also huge. I nibbled on it most of the day and still had half of it left for breakfast this morning. Perfect for these hot days: a Mama D popsicle. Are you following Hungry Memphis on Twitter yet? If not, you're missing such life-changing gems as this doodled-upon image of Oprah I came by in an old People magazine that was at Raffe's Deli.